It is widely accepted that a gravimetric measurement is more accurate than a volumetric measurement. Peptides play a key role in the growing segment of biopharmaceuticals. 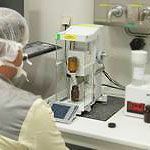 Discover how a top pharmaceutical company automated the slow, unsafe and expensive process of capsule filling for their pre-clinical trials.